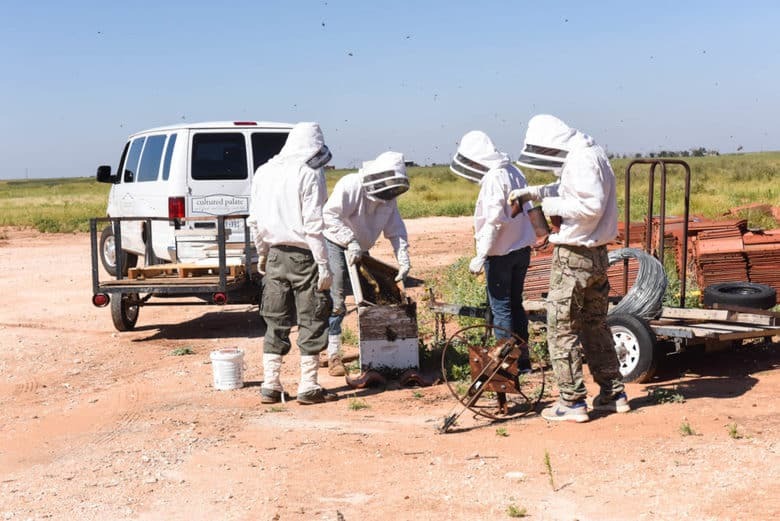 How to catch a swarm of bees is maybe not something you wonder about. But, when you see a swarm, and know the potential they have, it is a shame to let them go! 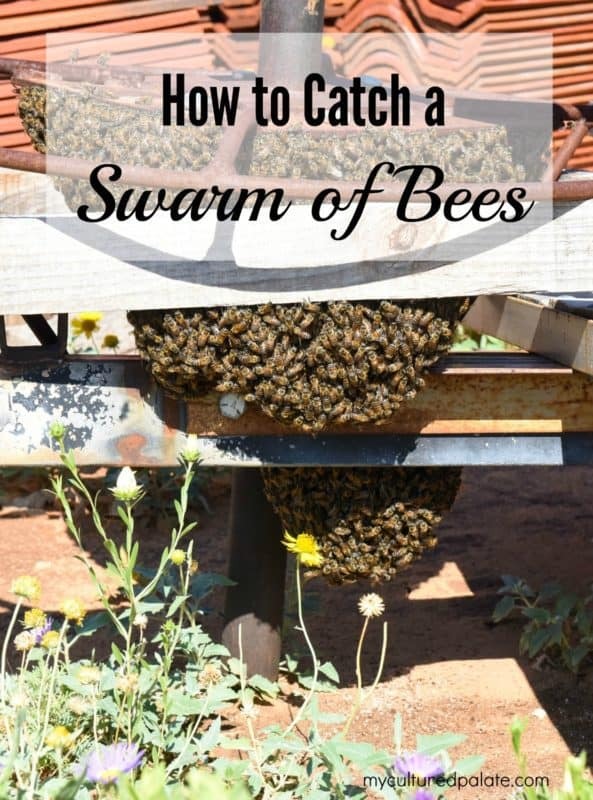 You could add to your collection of backyard bees! The bee cluster that you see in the photo above was one we found swarming. This is not the first hive that we have had swarming in or around the vineyard. Back in 2010, before we had bees and bee equipment, all we could really do was to watch the bees swarming. Bees swarm when there are two queens. 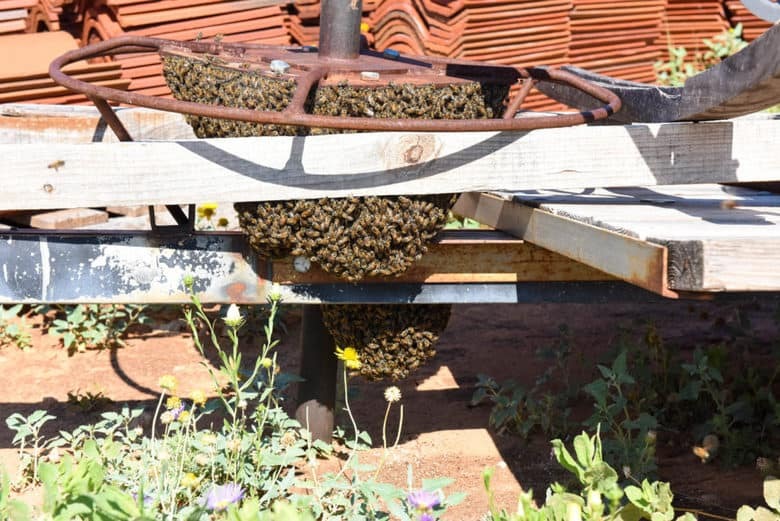 Many times, this happens when the beehive is large and outgrowing the current location. The older queen leaves taking her following with her to a temporary location. In the swarming hive, the queen is usually in the center for protection. Several scouts are sent out to find a permanent home. When they return, each scout tries to convince the hive that their location is the best. When one of the scouts successfully convinces the rest of a good new home, the swarm leaves to go to it. In preparation for catching the swarm, John and the children got into their bee suits. Normally, swarming bees are very docile and do not sting. But, you can never be to careful! Have the hive body ready (the white box). You can see the trailer in the photo above that the beehive is under. 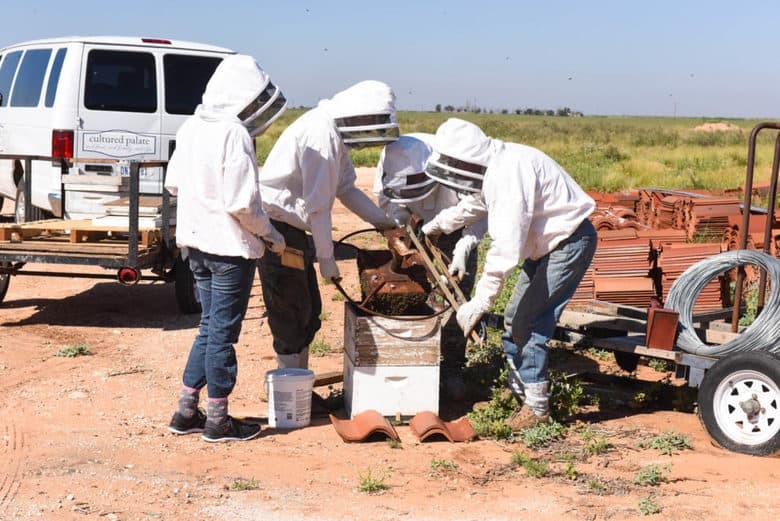 The part that the bees has landed on was removable so it was relatively easy to pick-up that part and hold it over a hive body that we want them to live in. 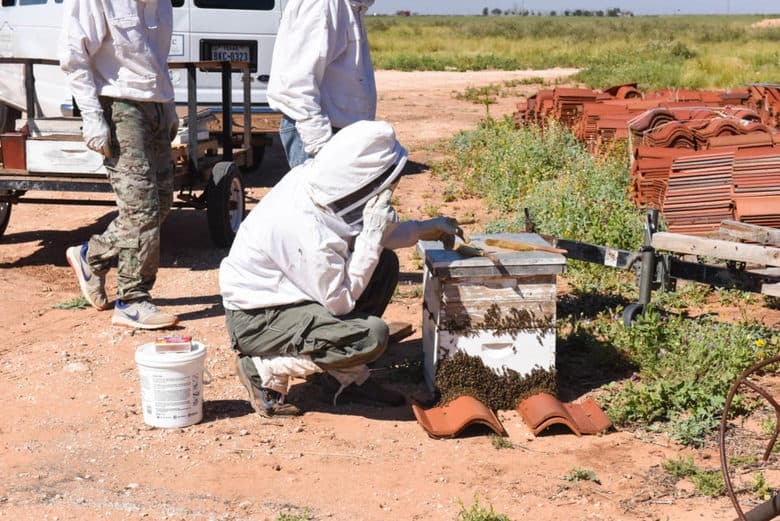 Carefully move the bees to the hive body. 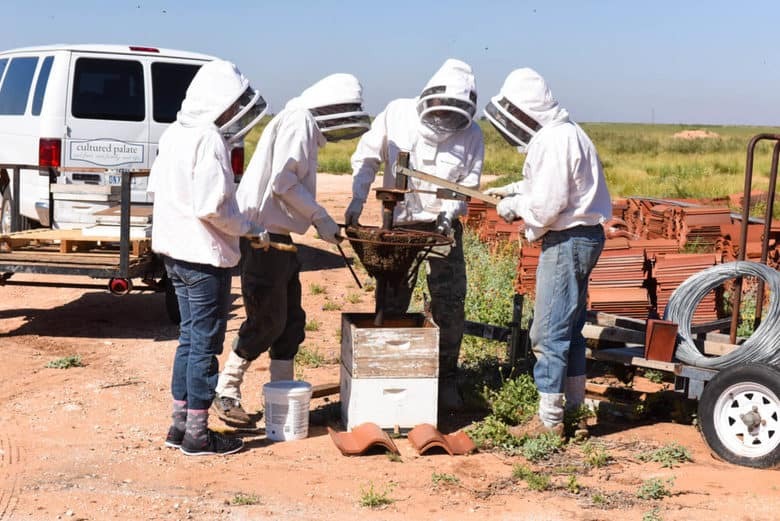 Armed with a flat brush to move the bees into their new home, the swarm of bees is held directly over the hive body boxes. 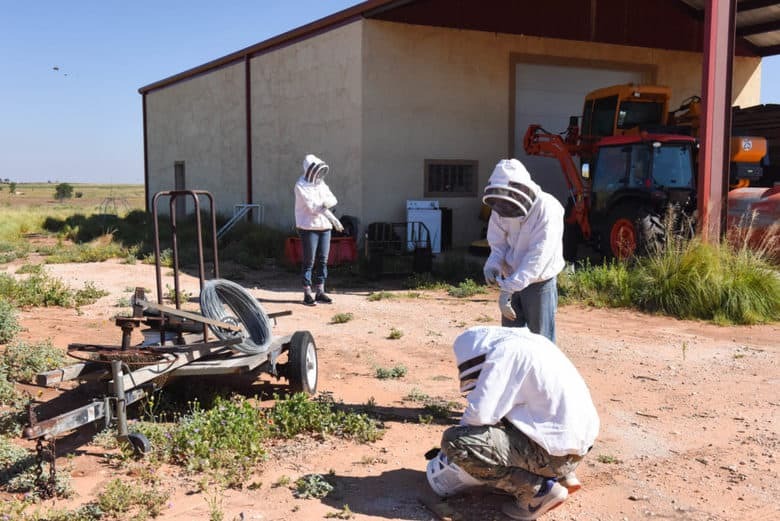 Before using the brush, the trailer part is held sideways and the majority of the swarm is carefully pushed off into the box. The last few bees are swept off into the box. Add the super which is another white box placed on top of the hive body containing frames for the bees to store honey in. Unexpected Event – Be prepared! Then, a scary thing happened! Keep in mind that swarms are normally docile so I was not even in a bee suit – I was just standing as close as I dared taking pictures. But, then a loud whirring noise started. It sounded like another swarm was coming and I was out in the open completely exposed. Looking over my shoulder, I saw a dark cloud coming and all I could think was, “RUN!!!”. 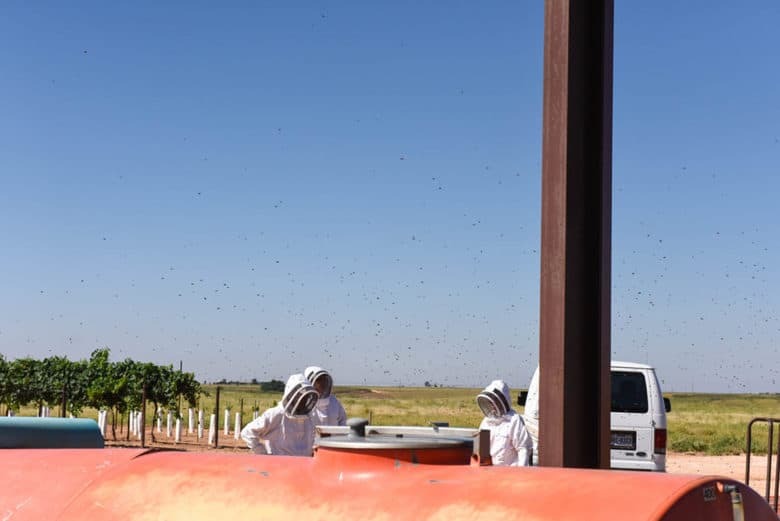 Once the new swarm of bees got to the barn, they spread out but here is the photo I took from behind the orange sprayer tank. There were black specks of bees all around. Now, I am not unreasonably fearful – afraid of heights, yes, but these flying bees were too close for comfort! 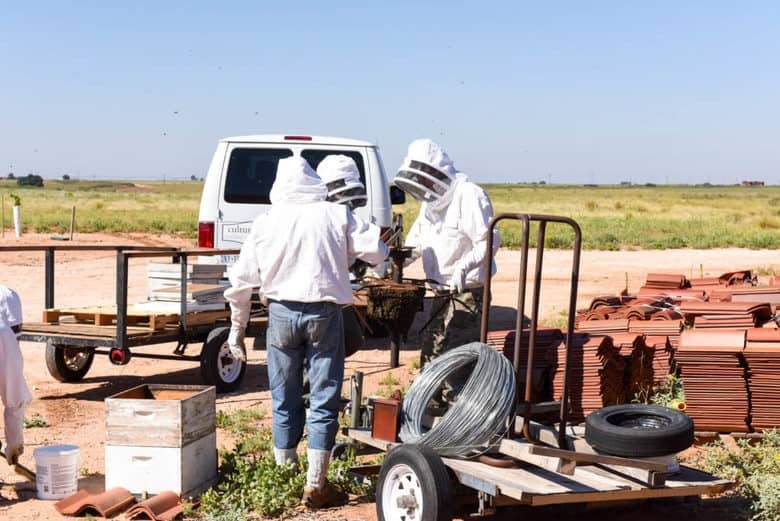 Finally, we realized that part of the hive was on the pile of clay roof tiles that you can see to the right in the photo below. They had swarmed completely around the barn and come back to where we were. All they needed was time to calm down and realize that the queen was in the box. You can see below on the outside of the hive body that they are congregating. Within a day or so, they were all inside and happy in their new home. The boys checked the hive a couple of days ago and all is well. The honey comb frames in the supers (another name for the shorter, upper boxes where the bees store honey) were nearly filled with honey! We will probably harvest honey before and after our grape harvest.